A long holiday weekend approaches! I should clarify one thing about yesterday's post. We won't lose our apartment with the sale of Stuyvesant Town, but the chances of affording a two-bedroom apartment in the complex are very slim. Market rents will likely be outside our budget or will closely approximate the cost of buying a co-op, in which case it will be time to start looking for a mortgage and another neighborhood instead of renting. It's all a big leap for two people who have never even owned a car before. And you can probably guess that the outlay for a two-bedroom apartment in New York is quite high, so it's a little daunting to take such a big leap. We're just sad that we'll need to leave. But enough whining. It's not like we're alone in this little adventure. I mean, Lola will be coming along too! *And have you seen this necklace at Anthropologie? It's the Hemp Flowers Necklace taken directly from the 2005 issue of Interweave Crochet. I'm not quite sure how they got away with copying the pattern exactly, but it's just one more project I've been trying desperately not to start. Purl has the magazine and the yarn, but be sure to leave a copy for me, please. I mean, how much willpower can a girl have? *Watching Little eat sushi. Who woulda thunk she would like it so much? When we went out for sushi tonight, we ordered her a few of the more tame (and cooked) things from the menu that we thought she would like. But she leaned over the table and started pointing to the pieces of raw fish that she wanted to try, and we weren't able to keep up with her little open birdie mouth. She wanted to try each different kind of fish. She finally reached across, grabbed herself a large piece of eel, and ate almost the entire piece. Our jaws really dropped when she went for seconds on the flying fish roe as well. *Hustle, a BBC television series that's been showing on AMC here in the states. It's smart, exciting, and totally worth staying up late to watch. *Reading this book to the kiddo. 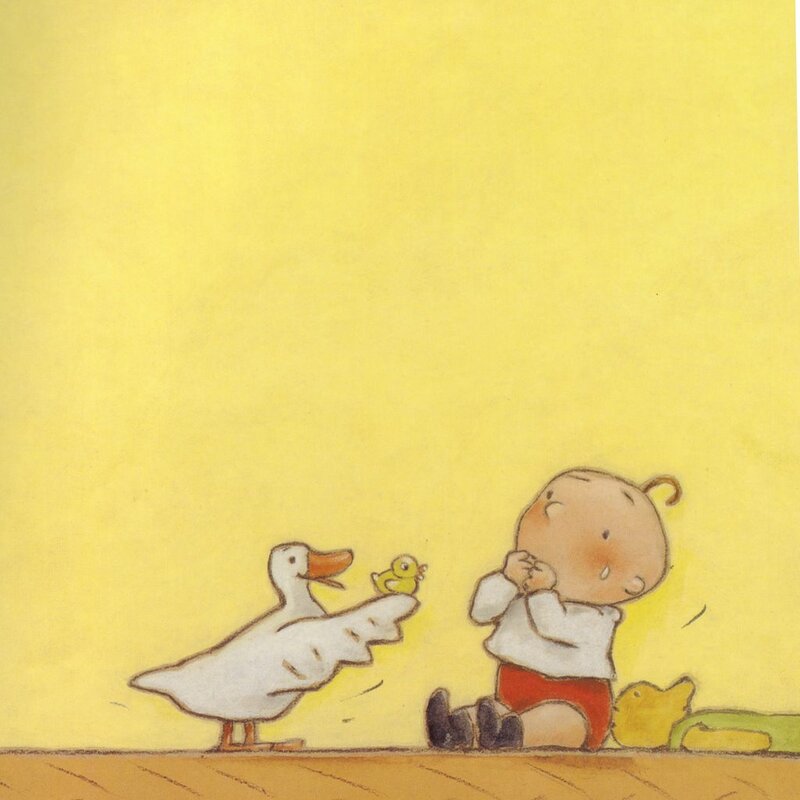 The illustrations are about as cute as can be, and it's fun to make the animal sounds as the cow, dog, cat and duck take turns trying to comfort the Boo-Hoo Baby. That is interesting about the Anthropologie/Interweave thing. Anthropologie is under the same ownership as Urban Outfitters, and UO has got itself a reputation for ripping off others' designs. Unless this pattern was licensed out, they're just daring people to sue them at this point. We tried to get our one-year-old to try some eel the last time we were out for sushi, but she wasn't digging it. She likes the rice and edamame though, so that's a start! It makes me happy when I see kids eating sushi -- I don't know why! 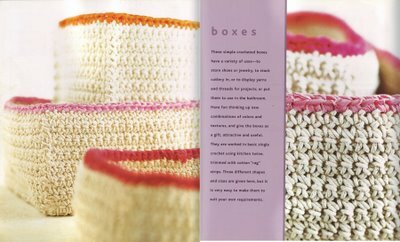 I have made those crochet boxes several times over. Each time I'm making them, another friend or relative or relative of a friend begs me to make them a set. They are really addictive, so don't cast on until you have time for them. Of course they could not be simpler, so each one goes quickly. Good for the subway. However, I have found that not all Manhattan hardware stores define "cotton string" the same way. The first ball I used was great for the project and made nice stiff-walled boxes. But, a subsequent ball bought at a different place required a little bit of spray startch for the taller boxes. oh, those crochet boxes are lovely! we love the boo hoo baby over here too. i'm sorry about stuyvesant town...our neighborhood in brooklyn is facing the same issues. I LOVE that necklace! I could acutally wear it too. I cant have anything on my neck... I get the worst headaches. Man. All I can say is that Brooklyn ain't bad. I like it a lot. If you start to look that far, check out the area around 5th Ave in Park Slope. Walkable to Prospect Park, walkable to Carroll Gardens, interesting neighborhood variety. Also, Windsor Terrace is lovely. Surely, I will not have been the only person to suggest these places to you, but I feel compelled to at any rate. It makes me absolutely crazy what is going on with housing in New York. I don't know how long prices on every single place all over the city can go up, but it doesn't seem to be slowing down. I thank my lucky stars every week that I bought when I did (3 years ago).